A telegram from Sir William MacKinnon (1823-1893) to Henry Shelton Sanford (1823-1891) dated June 16, 1879. The telegram indicated to Sanford the price of telegraphs obtainable from Aden, a seaport in present-day Yemen that was controlled by Britain and administered as part of British India during the period. It was of roughly equal distance between Mumbai, Zanzibar, and the Suez Canal, all of which were important destinations of British shipping routes. Original telegram from William MacKinnon to Henry Shelton Sanford, June 16, 1879: box 127, folder 2, subfolder 127.2.20, Henry Shelton Sanford Papers, General Henry S. Sanford Memorial Library, Sanford Museum, Sanford, Florida. 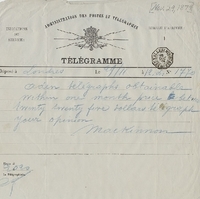 Digital reproduction of original telegram from William MacKinnon to Henry Shelton Sanford, June 16, 1879. MacKinnon, William. “Telegram from William MacKinnon to Henry Shelton Sanford (November 29, 1879).” RICHES of Central Florida accessed April 25, 2019, https://richesmi.cah.ucf.edu/omeka/items/show/4055.